Big History engages with the universe’s grand narrative, and provides a dynamic connection between the past, present and future. Our collection is divided into three volumes and is the first comprehensive global anthology of Big History. This second volume―Education and Understanding Big History around the World―considers the role of Big History in education and creativity, in the exploration of meaning, and in life experiences around our planet. This book will challenge and excite your vision of life and home. Together with the authors, readers will engage in a fascinating intellectual voyage and come to an understanding of our shared origins and futures. ACCESS chapter Mire S. (2016), Somalia: Studying the Past to create a Future. In: B. Rodrigue (et al) (Ed.) From Big Bang to Galactic Civilisations: A Big History Anthology. 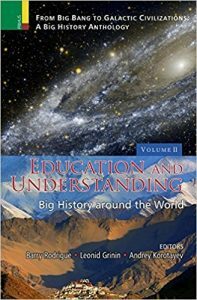 Vol II Education and Understanding: Big History around the World. Delhi: Primus Books. Related publication, open access: Mire S (2017), The Role of Cultural Heritage in the Basic Needs of East African Pastoralists. African Study Monographs, 53(Supplementary Issue): 147-157.